For a couple of minutes in a small, nondescript T-Mobile US conference room in Bellevue, the future of wireless is here. Two phone-book sized pieces of equipment stand about 8 feet apart, one representing a cell tower, the other the smartphone of the future. 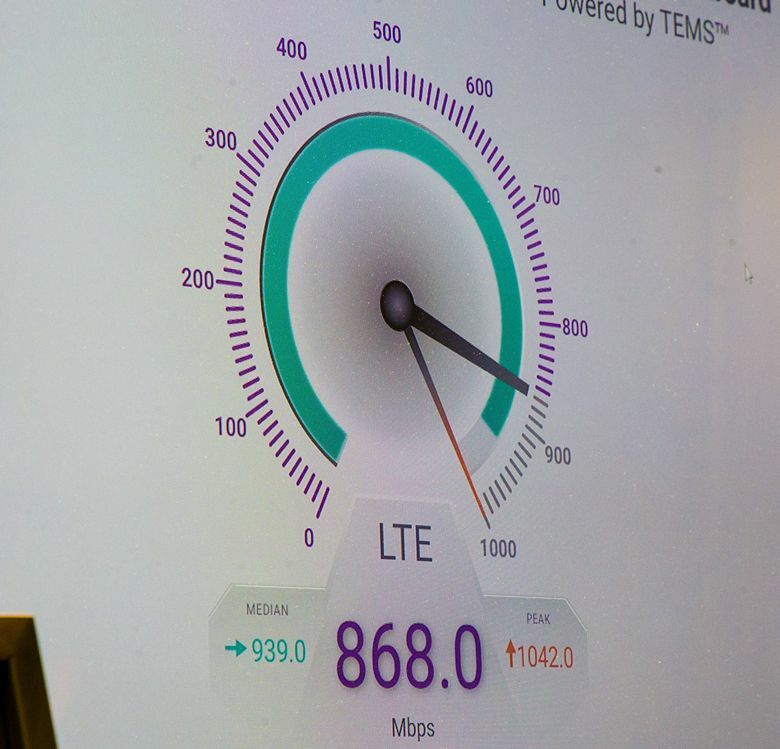 A nearby screen shows the transceiver is beaming download speeds that peak at 2,208 megabits per second — fast enough to grab a high-definition film in about 10 seconds — and much faster than the 12 megabits-per-second standard for LTE smartphones now. The breakthrough is brief, though. An engineer holds up a pane of glass, positioning it between the receivers while keeping out of the way himself. The download speeds on the screen dial drop significantly; much of the signal can’t pierce modern reflective, double-paned glass. Wireless carriers and their suppliers will likely spend billions to develop fifth generation, or 5G, wireless technology, a coming update to cellular standards that’s designed for superfast delivery of internet data. The technology will let users stream video to their heart’s content and experience virtual reality from their phones. Early signs are promising, T-Mobile is finding from extensive testing in its Innovation Lab tucked in an office park near the Spring District development in Bellevue. But it’s also clear how far 5G has yet to go. T-Mobile, the third-largest U.S. wireless carrier by subscribers, is a cornerstone of the wireless industry in the Seattle area, which decades ago was home to pioneering companies that went on to form components of all four major U.S. wireless carriers. Headquartered in Bellevue’s Factoria neighborhood, T-Mobile employs about 5,500 people in the region, including engineering outposts in Bothell and Snoqualmie. The company is growing its business, pairing an aggressive marketing campaign with a build out of current-generation 4G LTE wireless technologies that have helped the wireless carrier come closer to the service quality of its larger rivals. That’s important in the mature cellphone market, where the primary way for a carrier to expand is by drawing subscribers away from competitors. To spur even more growth, T-Mobile is expanding the size and head count of its technology lab, hosting 5G trials, doing more device testing, and also setting up office space to relieve some of the crunch at the company’s crowded campus down the road in Factoria. T-Mobile kept its lab, about 4 miles from its headquarters, largely closed to outside eyes over the years — and only recently added a sign to mark that the lab was there at all. “Little old T-Mobile has actually produced and launched some global firsts,” said Neville Ray, the company’s chief technology officer since 2010. G, which stands for “generation,” is used to identify different periods of cellular-connection standards. 1G: Handled phone calls, used when cellphones still looked like bricks. 2G: Text messaging is added. And teenagers rejoiced. 3G: Users can finally download pictures and surf the web. Smartphones are now a reality. 4G LTE: Might even be faster than a home Wi-Fi connection. 5G: Coming around 2020, blazing fast speeds. T-Mobile in February said it would aim to be the first U.S. carrier to deploy cell service relying on LTE-U — technology that uses broadcast frequencies typically meant for Wi-Fi signals. Another of T-Mobile’s recent lab inventions is the Digits feature, which allows a single phone number to ring across many devices. It also lets one phone hold multiple phone numbers. 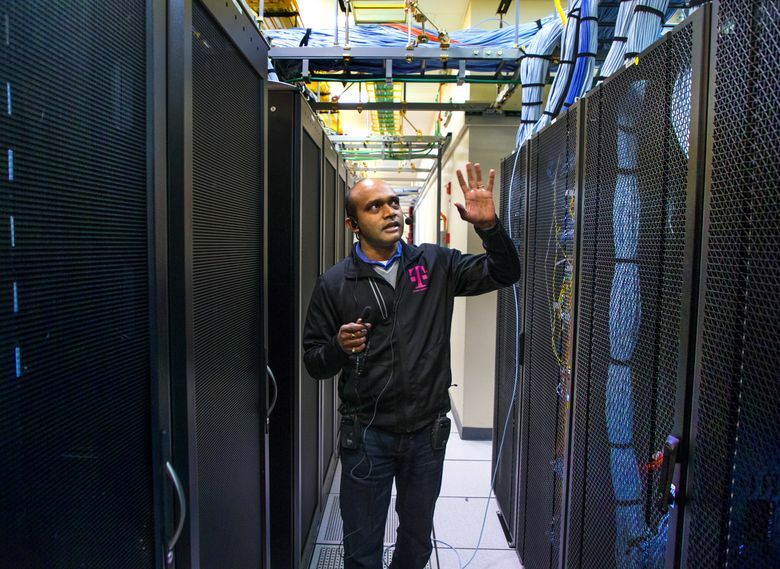 Inside the lab’s 78,000 square feet are a series of server rooms and testing pods where more than 100 employees run trials on every technology that makes its way to T-Mobile’s network, from phone calls to upcoming gigabit (1,000 megabits) download speeds. At the 5G demonstration lab, tightly controlled behind three layers of doors that require key-card entry, T-Mobile engineers and counterparts from Nokia — the builders of the hardware — test the interference created by various materials. Drywall? The large display dial opposite the engineer holding the piece of material shows a slight dip, but the download speeds hold strong. Less so when the engineer steps between the two receivers himself. The radio waves are almost entirely absorbed by his body. “There’s a lot to learn,” said David Jones, T-Mobile’s director of 5G systems architecture, including how to keep the connection strong through any material. 5G likely won’t become a widespread reality until after 2020, said CTO Ray. Hurdles remain, from radio-wave spectrum allocation to 5G-capable hardware to the consistent performance of the technology. AT&T will test a version of 5G technology, without the promised peak speeds, in Austin and Indianapolis this year. Verizon has also moved into the testing phase, and recently announced it will conduct 5G field trials in a few cities, including Seattle, this year. The tests will be for fixed wireless — essentially a replacement for home broadband internet. T-Mobile is taking a different approach. Fixed wireless and 5G, Ray said, are “not a match made in heaven.” It’s too limited, he said, and 5G could be better used to transform how people use their mobile phones. “We’re far more excited about what 5G can do for mobile consumers,” he said. The company envisions people experiencing virtual reality and other applications that require superfast data speeds on the go. That vision is partly a result of T-Mobile’s status as a wireless-only firm. In contrast, Verizon and AT&T, the top two U.S. wireless network operators, also have invested in areas such as home broadband as well as television and original content. T-Mobile, majority owned by Germany’s Deutsche Telekom, can be more focused in its 5G trials, but it also has less cash to work with. U.S. wireless companies don’t break out their outlays for research and development initiatives, but spending on buildings, machinery and other assets offers a clue. T-Mobile shelled out $4.7 billion in such capital expenditures in 2016. AT&T spent $22 billion, and Verizon laid out $17 billion. Grant Castle, a vice president at T-Mobile who oversees the Bellevue lab, says the company has built a reputation as a fast follower, quickly latching onto promising new technologies developed by others and helping bring them to market. Often that requires troubleshooting and software work with the likes of Nokia and Ericsson, the Nordic companies that build much of the hardware that makes up the backbone of wireless networks. Ray emphasizes there’s still a lot of progress to be made with current LTE technology. Gigabit download speeds over LTE could be coming in a limited fashion later this year, when upgraded phones are released. 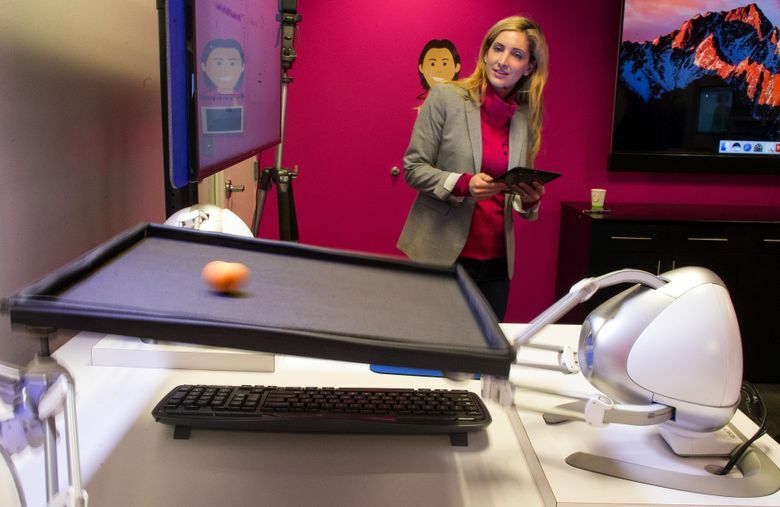 It’s already working in one of T-Mobile’s testing pods, which resembles a large walk-in refrigerator without the chill. Principal engineer Dinesh Kumar controls the signals being beamed into a handset locked inside a metal box. The shielding protects against extraneous radio signals that might interfere with the lab tests, as well as prying eyes. The smartphone model inside hasn’t been revealed to consumers. Slowly turning knobs, he activates four antennas, transmitting a signal to four antennas within the phone. A screen indicates that download speeds have reached 996 megabits per second, just short of a gigabit. Matt Day: mday@seattletimes.com; on Twitter @mattmday Rachel Lerman: rlerman@seattletimes.com; on Twitter @rachelerman.